Nov 10th, 2016 and the following morning brought two presents, that I really appreciate. 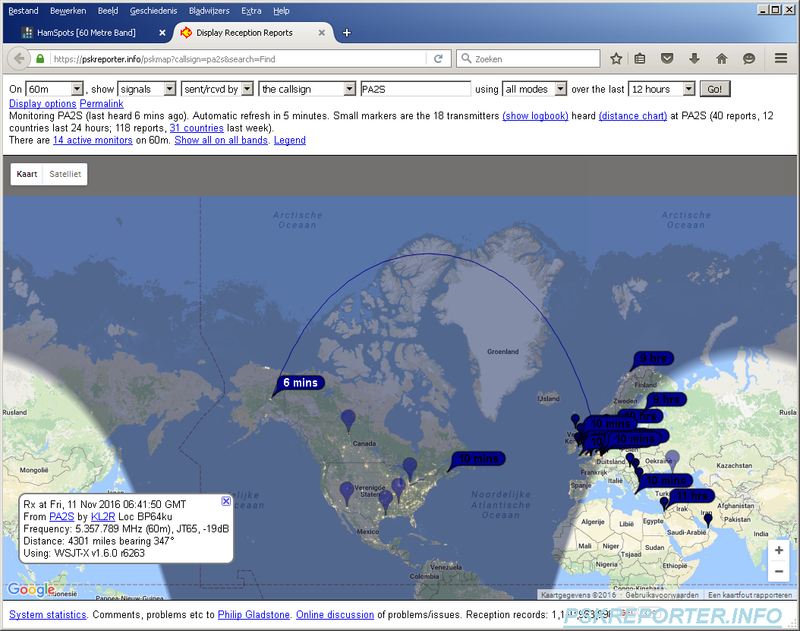 Reports from VK7BO appeared on Hamspots.net showing reception of European stations on 60 meters. I decided to put out some CQ’s to see if my signal arrived. Well it did! 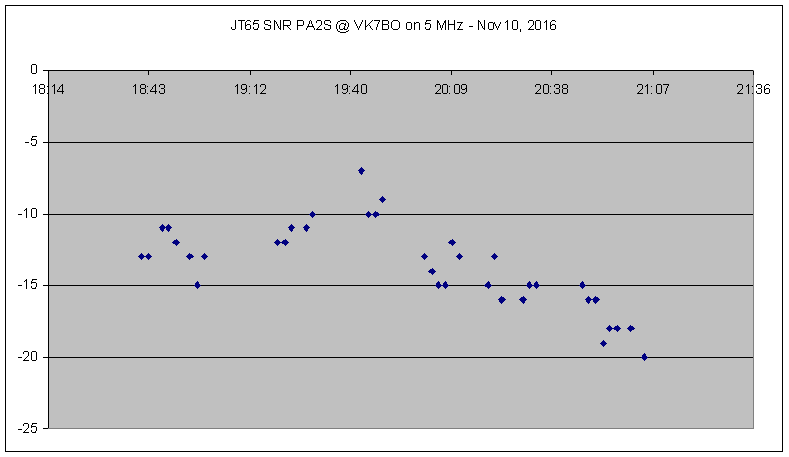 In the past, VK7BO received my JT65 signal, which was a surprise, but this time, the signal quality really stood out. Instead of a few decodes, my signal was captured very time during a long period. The signal strength was sometimes better than -10 dB, with -7 dB at best. I kept on transmitting to see how long the opening would last and how the signal quality progressed. When exactly the opening started, is not known, but it looks as if the opening started somewhere around 18:00 to 18:15 UTC. My first transmissions were at 18:41. The signal was lost just after 21:00 UTC. The opening lasted for over 2.5 hours! The CQ’s resulted in working a new entity (A6) as well, so it served two purposes: propagation research and the fun to add an entity. I was very happy! In my opinion this is what hamradio is about: experimenting and research. The magnetosphere was active, with minor storm conditions later on. 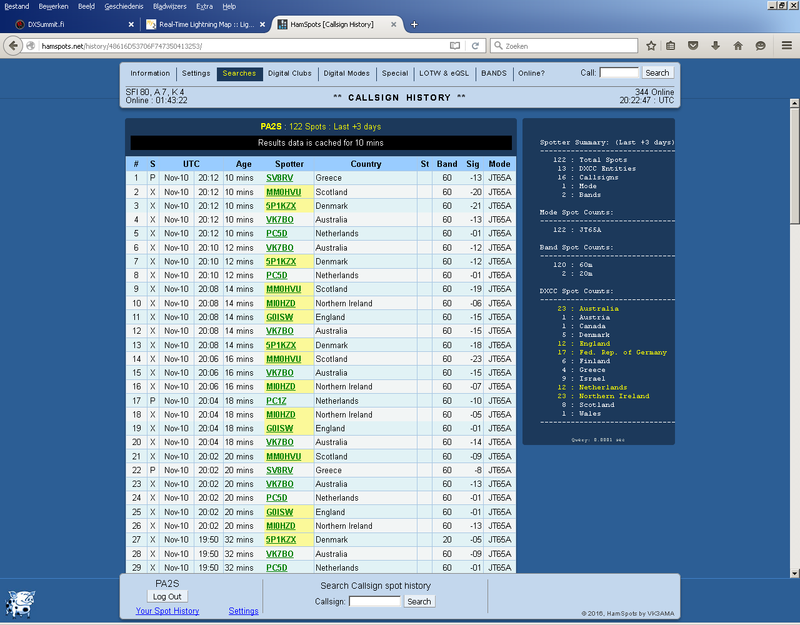 Around 02:00 UTC (Nov 11) the K index was 5. During the late afternoon on the 10th, aurora was reported on 6 and 4 meters. In the literature, I found claims that enhanced conditions occur just before a disturbance. I can only conform this. Not only by this opening, but for example, I regularly scan the bands around 5 MHz and for example, a broadcasting station from Alice Springs (NT) on 4835 kHz is often heard, but just before a magnetic storm, the signal is enhanced. According to one of my books, written by Russian scientist Yakov L’Alpert, it seems that the ionosphere is compressed by the changing fields. Although it is not always easy to predict these conditions, the aurora during the late afternoon could be an “early warning” signal, so it is definitely worth looking at various sources, to see if auroral propagation is reported. 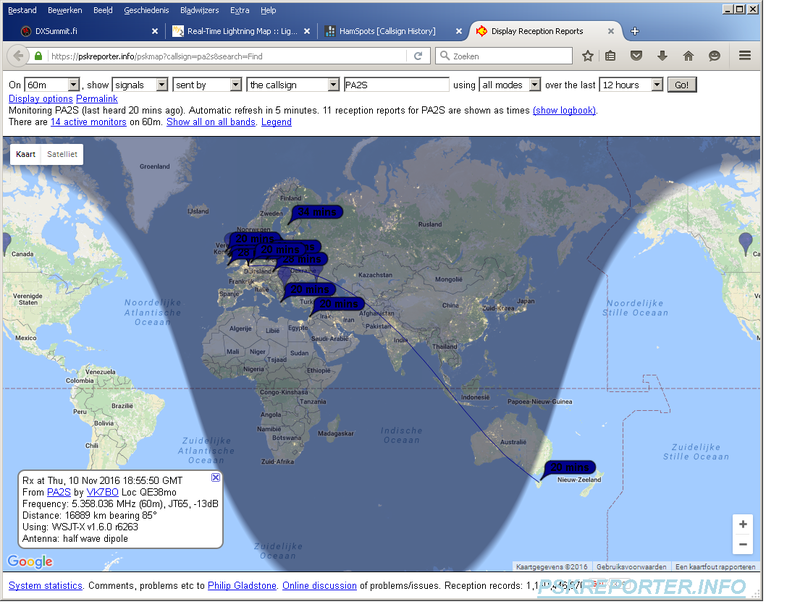 During the early morning of Nov 11, I noticed on hamspots.net that VK7BO received a Belgian station, so I started CQ’ing. My signal was not received, so after a few calls, I stopped calling. But exploring sites like pskreporter.info, I noticed that KL2R (Alaska) received my CQ. This was a real surprise, as I considered the path to Alaska to practically impossible, because it travels over the North Pole. 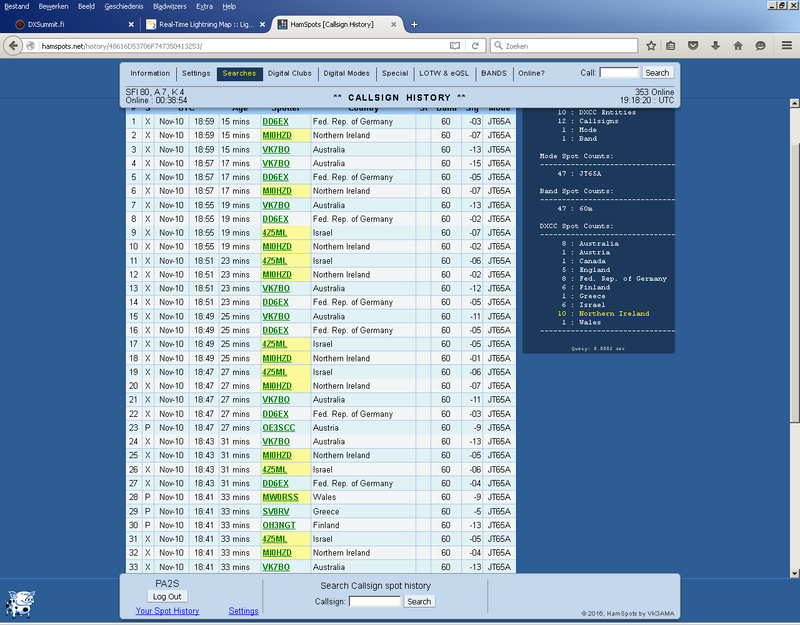 So not only good propagation to down under, but also over the top of the world.